If you are visiting this page, you or someone you care about may have been the victim of poor medical care that has caused injury or death. Many people make claims against health care providers, such as hospitals, doctors, nurses, pharmacies, nursing homes and others. These cases start with the question of whether the health care provider provided care that is less than what one would expect in the national medical community. If a doctor or hospital failed to meet minimum safety requirements in their treatment, they can be financially responsible for the harm that they cause. A medical malpractice case requires experts to testify that the health care professional provided substandard care that caused harm. We have been successful in pursuing cases against doctors, hospitals, pharmacies, and nursing homes. We can help you get your questions answered; just call us. If you believe you or a loved one were injured or had a medical issue worsen due to improper medical care, you may have a medical malpractice case. The Birmingham medical malpractice attorneys at Farris, Riley & Pitt, LLP want to ensure you receive the compensation you deserve so you can recover and move on with your life. 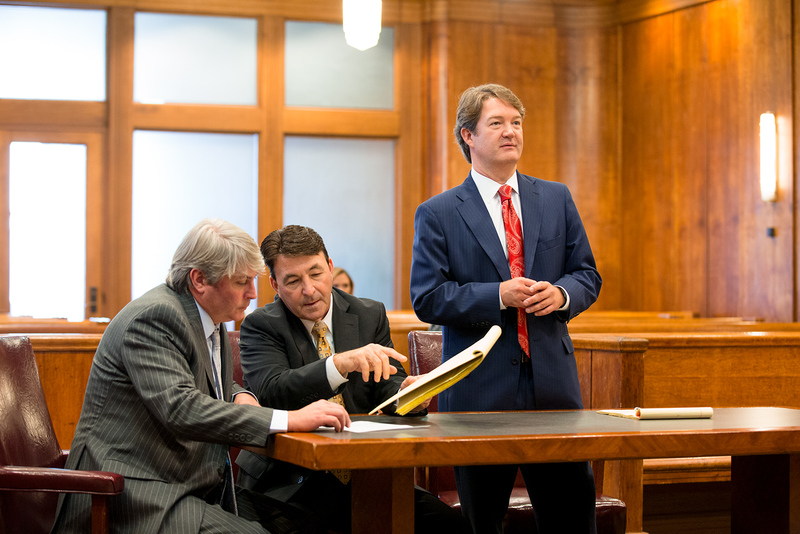 Contact us at (205) 324-1212 to discuss your case with a lawyer today. Why Do I Need a Medical Malpractice Lawyer? Farris, Riley & Pitt, LLP has been fighting for people all over the Birmingham community for more than two decades. Kirby Farris and Ken Riley are lifelong Alabama residents who reside in Birmingham. A medical malpractice action is difficult to file anywhere in the country, Alabama is no different. Most people do not have the specialized knowledge and resources at their disposal that the insurance companies for negligent medical professionals or institutions will. The good news is that you do not have to face these legal challenges by yourself. Farris, Riley & Pitt, LLP can work to help you obtain the compensation you are entitled to. You are likely facing a number of financial concerns that might cause you to think that you cannot afford legal representation. Farris, Riley & Pitt, LLP handles medical malpractice cases on a contingency fee basis, so you only pay us a fee if you receive a monetary award. Why Choose Farris, Riley & Pitt, LLP? Kirby Farris and Ken Riley are members of the Alabama Bar Association, Birmingham Bar Association, and American Bar Association. They are both admitted to the United States District Court for the Southern District of Alabama, United States District Court for the Northern District of Alabama, and United States District Court for the Middle District of Alabama, as well as the Alabama Supreme Court. Mr. Farris and Mr. Riley have obtained several multimillion-dollar verdicts and settlements. The attorneys of Farris, Riley & Pitt, LLP have over 100 years of combined legal experience. We work closely with all of our clients so you will always be fully updated on the status of your case. Our firm will diligently pursue a fair and full settlement, but we will not be afraid to file a lawsuit when an insurer refuses to provide adequate compensation. Farris, Riley & Pitt, LLP handles many different kinds of medical malpractice cases. If you suffered serious injuries or your loved one was killed because of medical malpractice in Birmingham or a surrounding area of Jefferson County, (205) 324-1212 to have our lawyers provide a complete evaluation of your case during a free consultation. Alabama Media Group reported in October 2016 that federal data showed residents in Alabama received fewer payments per capita in medical malpractice cases against practitioners than residents of any other state between 2004 and 2014. According to Alabama Media Group, roughly 90 percent of patients in Alabama who alleged injury due to medical malpractice lost their cases. Misdiagnosis or Failure to Diagnose — A misdiagnosis involves an incorrect diagnosis, a missed diagnosis, or a delayed diagnosis. A doctor could diagnose one condition correctly but misdiagnose or completely miss another. Failure to diagnose claims are usually based on a physician violating the standard of care either by not diagnosing or misdiagnosing a condition. Surgical Errors — In some cases, even highly skilled professionals commit critical mistakes during surgery that cause a number of complications for victims. In other cases, people may undergo unnecessary surgeries. Drug Prescription or Administration Errors — People can suffer severe or fatal injuries when they are given incorrect dosages of prescription medications or given the wrong type of drug. Birth Injuries — Injuries to children sustained during childbirth are one of the most common kinds of medical malpractice actions. Such claims are usually based on one or more forms of negligence committed during the mother’s pregnancy or delivery. Anesthesia Errors — Numerous complications can arise during the administration of anesthesia, including the dispensation of too much or too little anesthesia, delayed delivery of anesthesia, or the administration of the wrong kind of anesthesia. Premature Discharge — People with serious conditions who are discharged from hospitals too early may suffer complications requiring emergency readmissions. Infants are often involved in many premature discharge cases. Misreading or Ignoring Test Results — Physicians are usually provided with a wealth of medical information, including X-rays, MRIs, and computed tomography (both CT and CAT) scans, among many others. If certain signs on these types of reports are not properly interpreted or simply disregarded, it can be the basis for a medical malpractice claim. Any one of a number of parties could be liable in a medical malpractice action. While there are a multitude of situations where a person does not have a duty to another, usually the health care provider has a duty to his patient. All professional health care providers who have a relationship with a patient have a duty to that patient. The patient/healthcare provider relationship is often established when the doctor, nurse, etc. begins treating the patient. This is usually the easiest element to satisfy in a medical malpractice case. The health care provider has a duty to use established standards of care when treating a patient. A health care provider is held to a standard of other providers with similar education and in a similar situation. Going back to the previous example, if the lack of treatment leads to complications, you may have a claim. In order to have a successful claim, though, you will need to prove that the complications you or a loved one suffered were caused by the doctor’s inadequate care or could have been prevented had the doctor acted within the standard of care. This can be difficult in some cases, because in certain circumstances a doctor’s mistake may not have led to your complications. There are even cases where a surgeon and the staff do everything according to proper medical procedures during an operation and postoperative care, yet a patient still develops an infection or suffers another complication, which is why this is one of the more difficult steps in proving a medical malpractice claim. Our experts are invaluable in helping us create a clear timeline and cause-and-effect example of how the doctor’s failure to meet the standard of care directly led to your complications. Lastly, our firm must prove that not only did the doctor’s failure to meet the standard of care cause your injury, but the injury resulted in damages to you. Damages can include everything from pain and suffering for a surviving family after a medical malpractice error led to a loved one’s death to compensation for additional operations, treatments, or rehabilitations that were required due to the initial mistake. For example, if a surgeon makes a mistake that results in a patient being paralyzed, we can paint a clear picture for negotiations and a potential jury of what your life will be like now that you can no longer walk. This will include all types of things – from no longer being able to work in your previous field of employment to pain and suffering from no longer being able to participate as fully in raising your family or pursuing your hobbies as you once were. Calculating damages in medical malpractice cases can be complicated, and it’s important to seek out personal injury attorneys who are experienced with the nuances of the process, such as those at Farris, Riley & Pitt, LLP. We compassionately listen to your experience and go through an extensive investigatory process to ensure we account for every facet of your case. Our medical malpractice attorneys are aggressive during negotiations and never shy away from a trial if it means ensuring you receive the compensation you and your family deserve. To learn more about our medical malpractice process and to receive a free case evaluation, please call us any time at (205) 324-1212. Alabama Code § 6-5-482 sets a statute of limitations of two years on all injury claims. If a cause of action is not discovered and could not reasonably have been discovered within that period, then an action can be commenced up to six months after the date of the discovery. The exception provided in this law relating to minors only applies to victims less than 4 years of age, who are given until their eighth birthday to commence an action. What kinds of damages might I be entitled to? If a case goes to trial, a jury may award a victim compensatory and punitive damages. In most cases, compensatory damages are a combination of economic damages and noneconomic damages. The phrase economic damages refers to calculable past and future losses for victims, such as medical expenses and lost income. Noneconomic damages are more subjective and may involve awards for emotional distress or pain and suffering. In certain cases in which “it is proven by clear and convincing evidence that the defendant consciously or deliberately engaged in oppression, fraud, wantonness, or malice” toward the victim, punitive damages may also be awarded. Alabama Code § 6-11-21(a) establishes that punitive damages in most civil actions cannot exceed three times the compensatory damages or $500,000, whichever is greater. Under Alabama Code § 6-11-21(d), however, civil actions for physical injury are subject to limits of three times the compensatory damages or $1.5 million, whichever is greater. Does the consent form I signed prohibit me from recovering damages? Most consent forms are purely for evidence that you were informed of certain risks and have agreed to medical procedures. If the consent form (or a separate form) sought to release medical personnel and facilities from civil liability, such agreements are not always ironclad. A release form might be declared invalid if it did not identify a complication suffered by the victim or if it did not adequately define the complication. According to Diederich analysis, the 34 percent of payments made for diagnostic issues was the most common allegation. Surgery issues were alleged in 24 percent of cases, followed by treatment with 18 percent, obstetrics with 10 percent, and medication and monitoring with 4 percent each. The most common outcome in 31 percent of these cases was death. Significant permanent injury came in at 18 percent, major permanent injury at 17 percent, and quadriplegic, brain damage, or lifelong care at 14 percent. Minor permanent injury or major temporary injury both were 7 percent each. Cases involving injuries that could not be determined averaged $205,493. According to the National Practitioner Data Bank of the United States Department of Health and Human Services, there were 143,713 payments made for medical malpractice between 2006 and 2016. While a report published in the journal Health Affairs in 2011 estimated that just over 1 percent of hospital patients die each year because of medical errors, this translates to more than 400,000 deaths when taking into consideration the over 35 million people hospitalized each year. According to the Center for Justice & Democracy’s Civil Justice Resource Group, one-third of 1 percent of patients who are victims of malpractice have their cases go to trial, and only one-tenth of 1 percent of patients who are victims of malpractice win a trial verdict in their favor. Farris, Riley & Pitt, LLP has been helping injury victims for more than 20 years. Our firm will conduct an independent investigation of your incident and work tirelessly to make sure all negligent parties are held accountable. If you suffered serious injuries or your loved one was killed because of medical malpractice in Alabama, do not delay in contacting Farris, Riley & Pitt, LLP. You can have our firm review your case and discuss all of your legal options as soon as you call (205) 324-1212 or contact us online to receive free consultation. The staff is wonderful and so friendly. Handled my case as if it were they're own. This firm gives 100% on every case. During my experience with them, they became my friends. I recommend them any day of the week! They worked long and hard to make sure that I was given my due justice. I will never forget that. I would recommend this firm to anyone. They keep things simple, accurate and efficient. Thanks for everything you guys are doing for me. They truly care about their clients. I've never sent a client to them that wasnt pleased. They are very diligent and caring. Mr. Farris was very helpful towards my case. Thank you again for your time.